Secretary of defense nominee Chuck Hagel is deeply embedded with a network of pro-Iran foreign policy groups that have lobbied to lift economic sanctions and boost U.S. engagement with Tehran. Hagel sits on the board of Ploughshares Fund, a progressive foundation that has granted more than $2 million to organizations that employ some of Hagel’s most outspoken advocates, who favor lifting sanctions on Iran, oppose military action against its nuclear program, and hope to weaken the U.S.-Israel alliance. Organizations that have received donations from Ploughshares include the National Iranian American Council (NIAC), the Center for American Progress (CAP), J Street, the National Security Network (NSN), and the Truman National Security Project, among others. These individuals and organizations have worked closely with Hagel, a former Republican Nebraska senator, to oppose military action against Iran and to undermine pro-Israel initiatives aimed at bolstering the security of the Jewish state. These same groups are now waging a media campaign to ensure their long time ally becomes the Pentagon’s top official, a posting that would put Hagel in charge of developing plans for a possible military strike on Iran’s nuclear weapons program. NIAC, an advocacy group long suspected of concealing its illicit ties to the Iranian regime, has emerged as perhaps the most vocal defender of Hagel’s nomination as it pertains to Iran. The group has received more than $600,000 in grants from Ploughshares since 2007. "Hagel's prospective nomination should never have been controversial in the first place," NIAC President Trita Parsi recently wrote in the Huffington Post. "Hagel is a highly respected military mind who served both in the military and in the Senate with dignity and courage." Parsi went on to slam "neoconservatives" and pro-Israel activists for challenging Hagel’s nomination and said that Hagel, who has championed direct negotiations with Iran, would lead the charge to prevent America from attacking Tehran’s nuclear sites. "On Iran, his presence in the Obama administration would inject a much-needed dose of clear-sighted realism and strategic thinking," Parsi wrote. "He would provide Obama's national security team with the patience needed to ensure that America doesn't commit another strategic mistake such as Iraq." Parsi has also attacked Hagel’s critics in various news reports. Ploughshares has given NIAC hundreds of thousands of dollars to peddle "non-military approaches to resolving the impasse over Iran's nuclear program," as well as to increase U.S.-Tehran outreach, according to funding documents. Parsi did not disclose his relationship with Ploughshares in his pro-Hagel writings. The President Barack Obama-aligned Center for American Progress, or CAP, has also rushed to Hagel’s defense. It has received more than $300,000 from Ploughshares, including $250,000 for "an expanded initiative on Iran aimed at countering support for military action" against Iran. CAP, like NIAC, has publicly referred to Hagel as an "uncontroversial choice" despite outcry from lawmakers and Jewish leaders who maintain that Hagel is anti-Israel due to his controversial comments about the so-called "Jewish lobby." CAP has also claimed that Hagel is stridently pro-Israel. "The Nebraska Republican has a history of strong support for Israel, as this blog recently noted," the CAP Action Fund wrote on its ThinkProgress blog earlier this month. The National Security Network, a progressive foreign policy group that has decried all talk of military intervention in Iran, has defended Hagel on MSNBC and elsewhere. It received about $100,000 from Ploughshares in 2011. Hagel "has a really close, personal relationship with the president and that’s clearly very, very important to this president," NSN Executive Director Heather Hurlburt said earlier this month on MSNBC’s "The Last Word." "He’s also just been, you know, not in the pocket of the defense industry as, frankly, some of our intellectuals in both parties have." Hurlburt also took to the pages of U.S. News and World Report to lavish praise on Hagel’s "mainstream" foreign policy views. She did not disclosure her relationship with Ploughshares in these writings. Additionally, the liberal fringe group J Street has emerged as the sole Jewish community group to lobby on Hagel’s behalf. Ploughshares gave J Street $100,000 between 2011 and 2012 to "lobby Congress against the use of military force on Iran." J Street has been on the offense since the first rumors of Hagel’s nomination. The group has tried to convince a skeptical Jewish community that Hagel is sufficiently pro-Israel, yet it has not disclosed its relationship to Ploughshares. Hagel will serve as a "valued voice of reason in Obama’s cabinet," according to the Ploughshares-funded J Street, which has long lobbied to increase U.S. engagement with Tehran and weaken America’s alliance with Israel. Additionally, J Street founder Jeremy Ben-Ami told USA Today earlier this month that Hagel appreciates "the appropriate uses and limitations" of U.S. power. J Street and NIAC were also part of 2009 plot to torpedo Obama's appointment of Dennis Ross as an Iran envoy. The groups opposed Ross because of his tough stance on Tehran. Ploughshares also partners with the Truman National Security Project, which received at least $310,000 in part to "counter calls for military action against on Iran." Truman has united with the Center for National Policy in recent weeks to bolster Hagel’s nomination, according to reports. Moreover, Truman founding President Rachel Kleinfeld penned a pro-Hagel opinion piece in AOL Defense this month. She did not disclose her relationship to Ploughshares in the piece. Iranian opposition leaders and experts warned that Hagel has aligned himself with dangerous pro-Tehran players. "The nomination of Chuck Hagel is alarming for the future of U.S. foreign policy," said Saba Farzan, a senior fellow and head of Iran research at the Mideast Freedom Forum Berlin. "At the forefront within the debate happening in the US's capital is that groups like NIAC cheer for Mr. Hagel." "Now, whatever NIAC is it certainly is not an organization of true freedom for Iran," Farzan said. "As a matter of fact, Chuck Hagel and NIAC appear to be soul mates—both oppose sanctions until this very day, both have opposed classifying the [Iranian Revolutionary Guards Corps] as a terrorist group, both have a very anti-Israel standpoint and both advocate for dialogue with a regime that is using every second of those talks, going on for more than three decades, to brutalize its own innocent people and to act against U.S. national security." Hagel’s nomination has also been embraced by Tehran. "Iran is excited about this nomination," said Saeed Ghasseminejad, spokesman for the Iranian Liberal Students and Graduates association. "When Iran’s foreign ministry spokesperson was asked about Hagel’s nomination he replied that Tehran hoped the appointment of Chuck Hagel as the next U.S. defense secretary would lead to ‘practical changes’ in Washington's foreign policy," Ghasseminejad said. "His appointment undermines US effort to stop Iran’s nuclear problem." "[Iran] sees itself in a holy war against Israel. Iran sees Hagel’s appointment as a sign of decreasing support for Israel in D.C," Ghasseminejad said. 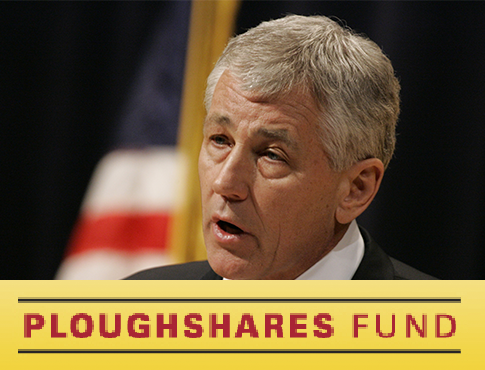 Other far left recipients of Ploughshares’ funds have quickly leaped to Hagel’s defense in the weeks since the president selected him. Media Matters for America (MMFA), the left-leaning media watchdog group that once employed purveyor of anti-Semitic language, M.J. Rosenberg, has touted Hagel in the press since benefiting from a nearly $100,000 cash infusion courtesy of Ploughshares. MMFA senior fellow Eric Boehlert lashed out at Hagel’s critics in the Huffington Post this month. The Nation Institute, publisher of the liberal Nation magazine, has also celebrated Hagel’s nomination. The institute has received $30,000 from Ploughshares’ coffers. "In almost every respect relevant to the position for which he was nominated, Hagel is remarkably well qualified," wrote the Nation’s Eric Alterman on Jan. 8. The New America Foundation has also reported for duty in the pro-Hagel media campaign. Steve Clemons, founder of the American strategy program at the New America Foundation, defended Hagel following a Washington Free Beacon report on his drive to shutter a popular USO port in Haifa, Israel. Clemons also defended Hagel after he was criticized for making highly inflammatory comments about gay people. The New America Foundation has accepted at least $150,000 from Ploughshares. Experts said it is clear that Ploughshares wants to help Hagel win confirmation. "The Ploughshares Fund has in recent years been Three-Card Monte for Tehran, shifting funding from organization to organization but always for the purpose of laundering Iran's image or advocating for its positions," said Michael Rubin, a former Pentagon advisor and Iran and Iraq. "With the Hagel operation, it certainly seems that Ploughshares hardly even tries to hide its political hackery." Ploughshares declined to make an official available for comment about Hagel. This entry was posted in National Security and tagged Center for American Progress, Chuck Hagel, Iran, J Street, Media Matters for America, Middle East, Nonprofits, NPR, Nuclear Weapons, Obama Administration. Bookmark the permalink.